Over 50 years ago, Sister Eleanor Stockert followed God’s call to become a sister. She grew up on a farm south of New England, ND. Interestingly, her father was the one who initially planted the seed of becoming a sister in her mind. Sister Eleanor recalls appreciating the prayerful and joyful spirit of the Benedictine sisters she met at summer vacation school. 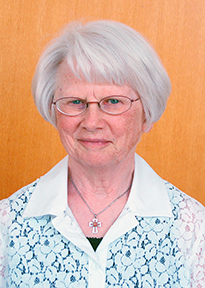 At 19 she joined the Benedictine Sisters of Annunciation Monastery in Bismarck. Sister Eleanor was sent to St. Joseph’s Convent in Mandan where she served as homemaker, helping in the kitchen, laundry, and sacristy at the church. From there, she worked in a Dickinson nursing home. She worked at the Bishop’s residence for one year, followed by seven years in laundry and homemaking at Annunciation Monastery. Sister Eleanor worked as a dietary aide at St. Alexius Hospital, Bismarck, for nine years and fulfilled her dream of working as a nurse aide at Garrison Memorial Hospital, Garrison, ND. She especially loved working with the children. After five years, Sister Eleanor moved home and became a nurse aide at the monastery. A woman of diverse interests, Sister Eleanor learned the art of T'ai Chi Chih®Joy Thru Movement. After discovering its healing benefits, she became interested in sharing it with others and became a certified instructor. She offers T'ai Chi Chih classes through Annunciation Monastery’s Hospitality Center. Within the monastery, Sister Eleanor cuts hair and has varied duties within the house.